Roil Energy originally started life as Steve Rutherford welding. It was Steve’s integrity, reliability, and commitment to his craft – in combination with his expertise as a craftsman and innovator with over 40 years’ experience in the welding and fabrication industry that allowed him to excel as a locally owned and operated company serving the Grande Prairie and Peace region since 1996. Roil Energy is now in its 20th year of providing exceptional service to our valued clients and we haven’t forgotten our roots as a company that is based on continuous innovation, intelligent designs and attention to detail that sets our work apart. Over the course of our 20 years we have trained dozens of our employees in picker truck operation and specialty “in building” lifts as well as welding, pipefitting, plant and field maintenance, carpentry and mechanical services and we have grown our fleet into a wide range of trucks and equipment. Today, we put picker trucks, ‘hot-shot’ and light hauling units, tool trucks and portable welding units on the road each day. Our partners work in industries that demand adaptability and a high bandwidth of service and support. After years of successful business, our clientele is as diverse as the needs we meet for them. We have grown a great deal since our humble beginnings! Today our expertise and equipment bring value and an exceptional level of service in all facets of our very diverse offerings be it boom-truck operation and specialty picking, welding, pipefitting, oilfield maintenance, or modular services. Each of our clients are serviced by our fleet of specially-equipped and maintained pickers, service trucks, tool and pipefitting trucks or portable welding units. No matter your need, we have the vehicles, supplies, and expertise to keep you working. With a hard-working team, a fleet of maintenance trucks, pickers, and light hauling units – not to mention a pristine safety record – Roil Energy has built a solid reputation for reliable service in general oilfield maintenance, as well as our expertise in specialty picking situations. We provide general picker truck and custom “in-building” lift services to the oil and gas industry, in addition to many other jobs including commercial construction, man-basket work, and much more. The maintenance of any site is a key consideration, especially when safety is an issue. Whether your site requires pipe fitting, general labor, turn around services and many other specialty maintenance services, we have the skilled personnel and equipment to handle these processes. We have portable welding units and fully-equipped fabrication shop. Our services are not limited to the oil and gas sector. Bring us a challenge. We will create a solution. We provide modular structures – or ‘camp shack’ set up, removal and maintenance for a multitude of industries, including oil & gas, forestry, any other remote worksites, in addition to commercial modular buildings. John who was born and raised in Grande Prairie joined the Roil team in May of 2016. 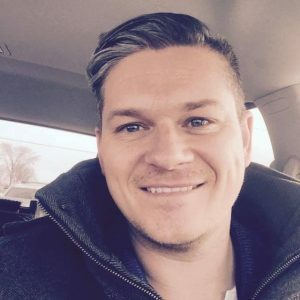 John brings with him a journeyman certificate as a carpenter as well as a diverse back ground in management with over ten years of management experience in the modular structures industry as well as owning and running his own successful camp services company for several years. John has helped Roil develop their Modular services division as well as taking on the General Manager role dealing with the day to day operations of the company. James left his career in the automotive aftermarket industry and came on board as a partner in May of 2006. Initially starting out as an assistant on a maintenance truck, he later rigged-out Roil’s first Picker/Maintenance tool truck. As partners, Steve and James rapidly grew the company and added additional trucks and pickers. James went on to become a journeyman boom truck operator, working in the field over the course of the next ten years, while running the company’s operations until Roil moved into its new base of operations in October 2014. Presently, as President and General Manager at Roil Energy, James spends most his time in the company headquarters’ main office. James has made the outskirts of Wembley his home where he lives on an acreage with his wife Amber and their three kids. 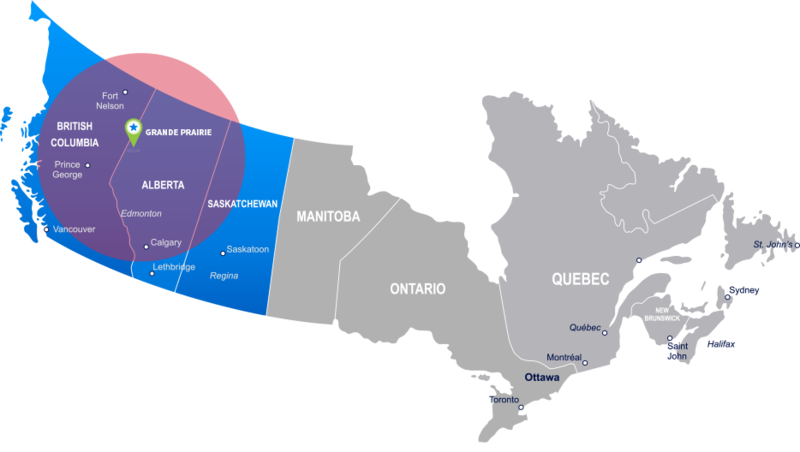 As shown in the map below, our service areas extend a good distance from the Grand Prairie area encompassing most of Alberta, the eastern bulk of British Columbia, and northwest Saskatchewan. If you aren’t sure if we can get you, please contact us and we will get back to you quickly with an answer. I have yet to find a job Roil couldn’t complete. When it requires anything above and beyond the normal, they engineer it and build it to get the job done Right. They make what we do an easy task. My first and last choice every time. Roil Energy Services continues to impress us with top of the line equipment, workmanship and a firm commitment to safety. Roil is excellent in their attention to detail and exceptional in their customer service. They are great to work with being a local company, and knowing that their interests are making sure that the customer is 100% satisfied in whatever task they are assigned. I have worked with Roil Energy Services for years, they continue to go above and beyond for us. Great, reliable, service. Roil Energy proudly services the Grand Prairie region’s industries with our fleet of picker and light hauling trucks, tool trucks, welding units, and more. With a flawless safety record, Roil Energy performs maintenance and pipefitting, welding and fabrication, and the set-up and tear-down of modular structures for remote worksites. Our clients work with us because we streamline many aspects of their operations with safety and efficiency. © Copyright 2019 Roil. All rights reserved.